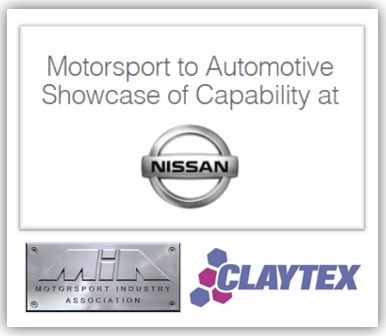 Claytex will be exhibiting at the MIA’s (Motorsport Industry Association) Motorsport to Automotive Showcase of Capability event at Nissan. Nissan challenges conventional boundaries – from their highly successful Qashqai, to the Juke crossover and the LEAF – their flagship for Zero Emission mobility. Engineers at NTCE (Nissan’s centre of excellence for the design and development of vehicles manufactured in its European plants) are pivotal in the design and development of next-generation vehicles, delivering customer oriented engineering and new products to meet the specific demands and desires of the European market. We would like to invite all the engineers at Nissan to attend this event where a number of MIA members will be showcasing their engineering capabilities. If you have any questions or would like to schedule a meeting with us during the event, please do not hesitate to contact us.